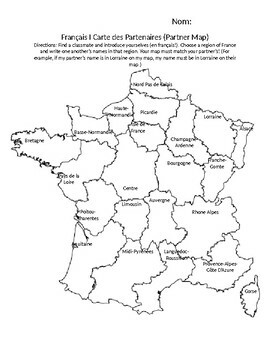 I use this partner map on the first day of French class to help students learn how to introduce themselves to one another and to create a resource to use all year for randomly partnering students. Students must go around the room, introduce themselves to one another, then pick a region of France to write one another's name in. Then, throughout the year, I can say, "Find your Bretagne partner!" and students can pair up for various speaking activities.